A low lint painter's cloth used for cleaning and absorbing solvents, paints and chemicals that is rough textured and smooth textured on alternate sides - like two wipes in one! Painters cloths need to be tough, yet absorbent. You have many different viscosities of liquids to deal with as a professional painter. Latex paints, oil-based paints, stains, gels, and thinners all figure into your potential mess-making repertoire, and TIDDOX's PAINTERS SOLVENT RESISTANT WIPES are just what you need for cleanup. These tough towels are made of polyester-reinforced wood pulp. Each painters cloth is rough on one side so that you can scrub and clean with it. The other side is smooth and soft. You can use it for polishing and shining once the surface is clean. The fabric of these painters wipes is so absorbent that it will stop any spill from spreading. You certainly don’t need a spill to ruin the flooring on a job site, and a wiper like this will help eliminate messes. Each paint cloth will hold onto the liquid or semi-liquid until you can take it to the trash can. And don’t you hate it when someone steps in a spill and tracks it across the floor? Now you have a dozen messes to clean up, instead of just one. Then, you have those painters cloths that come apart when you soak them on solvent. 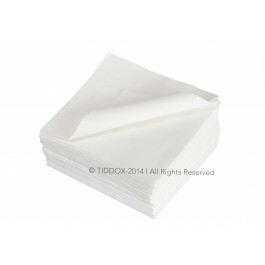 TIDDOX’s SOLVENT RESISTANT WIPES are tough enough to hold up as you clean brushes, spills, and more. They come in a case with 6 packages of 50 wipers. This gives you enough to place around the worksite, where they’ll be handy for every worker. Try them out, and you won’t want any other painter’s cloth!